I was born in a standard concrete-covered swath of suburban sprawl in New Jersey but grew up in rural Vermont where we got only three channels: ABC, CBS, and the punishingly boring PBS. This lent an air of mystery and excitement to the NBC network, which once every several months briefly flickered into something other than a swarm of hornets in a snowstorm. The most prolonged instance of this was when my brother and I, praying throughout like mediums trying to sustain contact with the dead, were able to understand most of the proceedings in an extremely fuzzy broadcast of Super Bowl XIII. But Quark, Land of the Lost, Chico and the Man, and the rest of NBC’s lineup existed as magical but almost completely indecipherable whispers from another dimension (a dimension that I assumed was better than the one I was stuck in). I mention all this because I liked Ken Forsch a little better than Bob Forsch, and I don’t really know why. In retrospect, I would have thought it would have been the other way around, since Bob was, like me, the younger brother. But one Ken Forsch versus Bob Forsch theory of mine builds from the thought that the National League was a little like NBC to me back then. In central Vermont, only the Red Sox and their American League opponents offered hints of a life beyond these cards, so I was left to make up the world I imagined the National League to be. 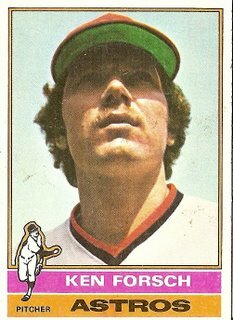 In that world, there was something dazzling and full of promise about Ken Forsch’s team, the Astros, whereas Bob Forsch’s Cardinals struck me as drab and leaden, their time long past. It was like the difference between a new issue of Dynamite Magazine and a National Geographic from a box in the attic. But it’s also possible that my slight preference for Ken Forsch is simply because the sound and appearance of the words “Ken Forsch” appealed to me a little more than the slightly more cumbersome “Bob Forsch,” the long-voweled “Bob” slowing things up a bit in and of itself and even seeming to influence “Forsch” into being a more sluggish version of its counterpart that hustles along briskly to keep pace with the crisp, swift “Ken,” the scrubbed “Ken Forsch” pairing spiriting across an ivy-riddled campus toward a lecture on molecular physics while the thick-ankled “Bob Forsch” duo loiters inside a malodorous Dodge Duster, cow-chewing bread-heavy grinders. Of course, none of this explains why Ken Forsch is gazing at the sky as if he’s spent the entire offseason reading Nietzsche. You are currently browsing the archives for the Ken Forsch category.